This short embellished homecoming dress by Blush has a whimsical style ideal for this year's big dance. 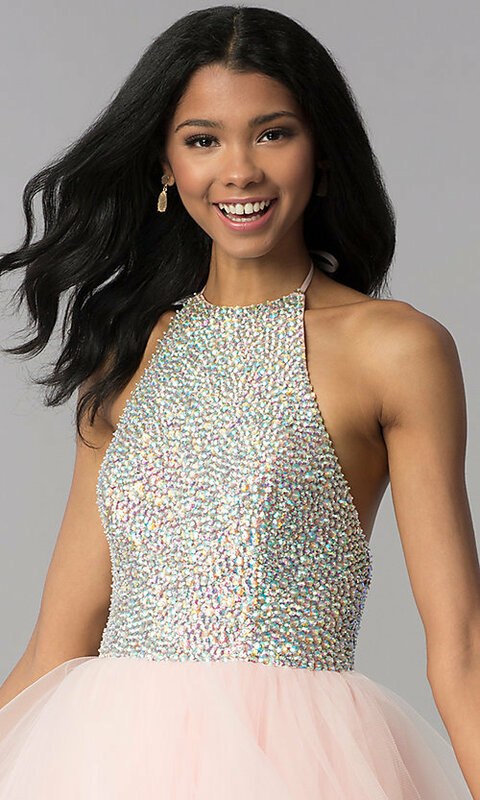 Defining the on-trend look, the slender racer-front bodice of the designer hoco party dress is embellished with bright rhinestones and beads. Adding to the allure, a chic high neckline shapes the top of the fitted bodice and leads to a flirty halter tie behind the neck. The thin bow that fastens the halter at the nape of the neck hangs over an open back to amplify the playful appeal of the embellished party dress. Ending with structured horsehair hemlines, layers of voluminous tulle flow over the hips in tiers to complete this short homecoming dress with a cute a-line shape.